Today I have a great news for all who loves pampering themselves by going to salons to enhance their beauty and wellness. We know many websites which offers great deals and discounts on restaurants,shopping sites and other goods.We have also seen sites which offers good beauty packages at cheap prices but do you know about any website which is mainly focuses on taking care of your beauty and spa needs?No,nah? So today I will introduce to you to this wonderful site Stycue which focuses on its client's complete care just like your personal stylist. 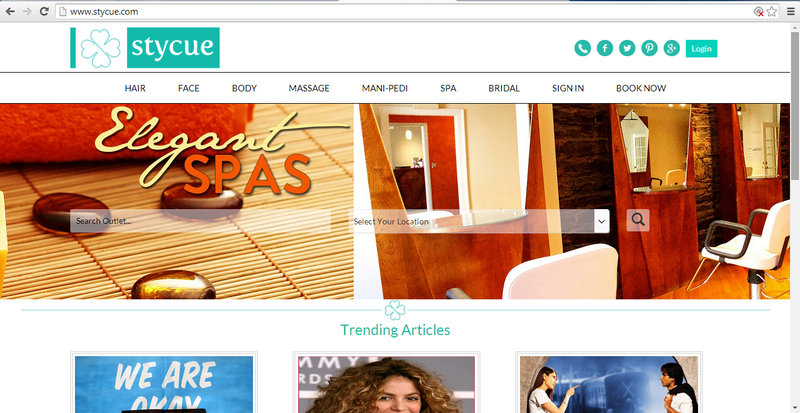 Stycue is a website where we can book our beauty and spa appointments online or over phone.At Stycue,we get great deals on salons in Gurgaon,Greater noida & Noida which helps us in saving lots of money on our favourite salons. This site is very well categorised so that we can easily search outlet according to our preferred location.We can see amazing deals on hair,makeup,manicure-pedicure,spa and bridal packages,etc. I was reading their blog as I too was curious to know why should I choose Stycue over other websites and why should I recommend it,then i cam across this article by Stycue team which very well explains why Stycue is best ..
Stycue follows your instructions and tell you what works for you and what doesn't. With city-specific search engines,further optimized to provide you location-specific assistance,Stycue does all your work for you.For example,it will find best nail spa or fish pedicure salon or whatever you're looking for. IT DOESN'T EXCLUDE MEN~Yes,Stycue have compiled listings of unisex as well as all-men wellness clinics so that men can pamper themselves too! Through regular newsletters,Stycue notifies you when your favourite salon is offering you discounts or when there's new spa in your locality. 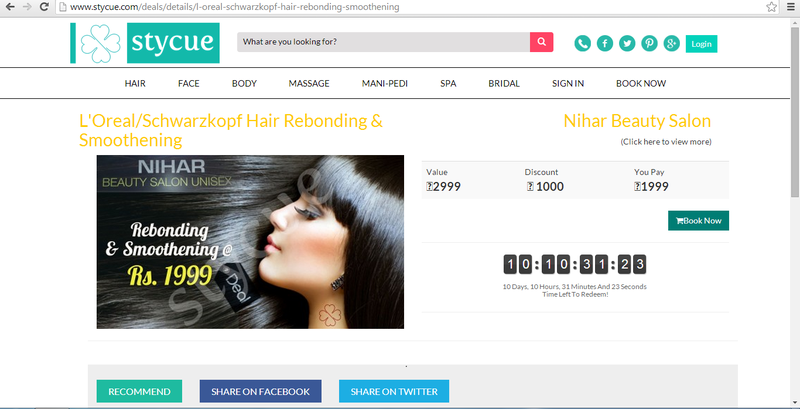 I explored their website and checked all unbelievable deals.I liked this great deal and I might book this deal soon for hair rebonding as after few months I know my hair will need re-bonding again! To stay connected with Stycue,you can follow them on social media! I was wondering, would you like to follow each other on GFC / FB? Designer Bridal Saree is perhaps the desire of every single girl in this world to look amazing on her wedding day.